We publish a small number of articles from each issue of When Saturday Comes on here. To get the full WSC experience, including free access to our digital archive of every issue, take out a subscription. 27 June ~ Spain, again. The Azzurri beat La Roja for the last time in a competitive match at the World Cup in the US in 1994. The two Baggios (Dino and Roberto) scored the goals, but after that Italy lost to Spain in the Euro 2008 quarter-finals on penalties, 4-0 in the Euro 2012 final, and on penalties again at the semi-finals of the 2013 Confederations Cup. The last victory was in a friendly in Bari five years ago. 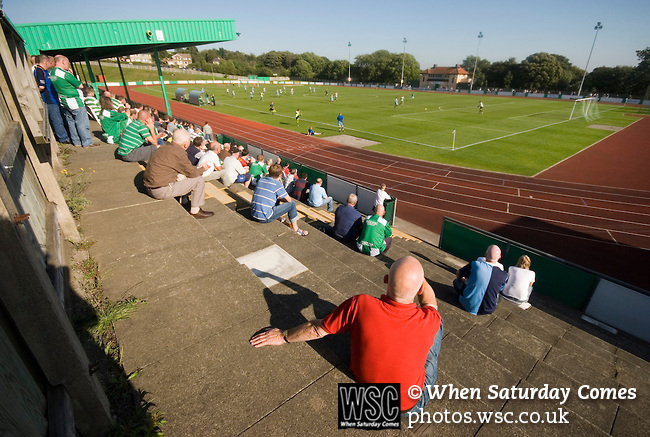 Bradford Park Avenue 4-1 Bishop Auckland, FA Cup first qualifying round, Horsfall Stadium, September 12, 2009. 25 June ~ At full time in Stade Bollaert-Delelis, as England fans and players celebrated Daniel Sturridge’s late winning goal, Chris Gunter made straight for the Wales fans at the opposite end of the field. As he reached that red-clad corner of Lens, Gunter, the most-capped player in Chris Coleman’s squad, gestured sternly at those applauding back at him, to keep their chins up. 24 June ~ I have just got back from France where, seeing my friends’ white-and-red regalia, people reacted by saying, “You will beat Switzerland, you’ve got Lewandowski!" Those people were probably referring to “Lewy” from Bayern as he’s now almost a totally different player with the national team he captains. 24 June ~ A day after Austria’s defeat in the final group match against Iceland, the country are licking their wounds. Finishing bottom of their group came as a shock for head coach Marcel Koller and the team who had qualified with ease. Of course, the so-called legends were the first to judge. “It’s a fiasco,” said former national coach Hans Krankl in the tabloid Osterreich. In the same article, one journalist wrote: “The Euros were Austria’s Waterloo – and now the international press are laughing about us”. 23 June ~ Southampton ’til I die. Or at least until I know who is managing the first team next season, their philosophy and vision for the club, and whether or not they will be given the sufficient budget to recruit the new players necessary to be successful. 22 June ~ Before June 8, the Portuguese had generally been a little sceptical about their team’s chances in France. Then they played Estonia at the Luz in the last warm-up match and knocked seven past them in a dazzling display of attacking football, with a seemingly rejuvenated Ricardo Quaresma scoring twice and assisting for another two. His resurgence offered coach Fernando Santos a viable 4-3-3 alternative (with Quaresma joining Cristiano Ronaldo and Nani up front) to the preferred 4-4-2, and suddenly the European title he’d been promising seemed very doable. 20 June ~ With Euro 2016 nearly halfway though and the Champions League, FA and Scottish Cup finals barely behind us, it feels like the entire planet wants to attend a football match. Huge, packed venues dominate the media. And all I do is rue the fact I’ve never been in a six-figure crowd and that no ground in Europe can currently hold one.